It is layoff season at a software company, and programmer Peter Gibbons (Ron Livingston) has come to the realization that he hates his job. He sees a shrink hoping to be able to deal with daily life, and came out perfectly apathetic to the pressures of work. Peter’s life seems to improve, but he notices that his therapy also had unintended consequences. 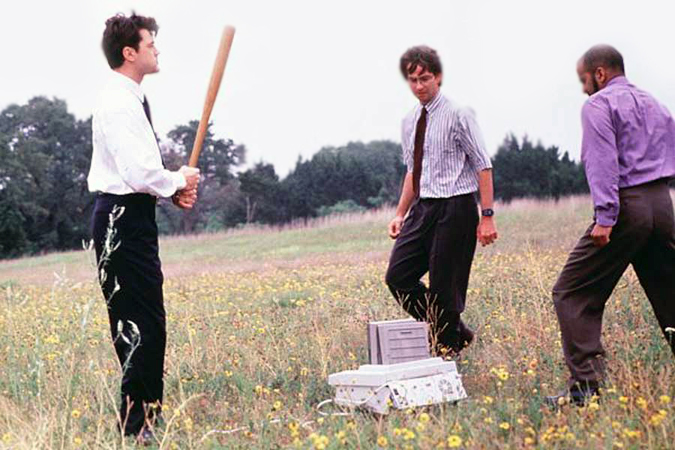 Office Space is a comedy set in a typical white-collar workplace a la Dilbert. Possibly due to the fact that I myself came out of my first experience working in an office as an intern, I was able to appreciate the humor the movie had to offer. Overall, Office Space was well-acted from the cynical Michael Bolton (David Herman) to the outright insane Milton (Stephen Root). The only issue I could really think of was that Peter didn’t seem consistently apathetic throughout the movie; the best example of this was when he thinks that his girlfriend Joanna (Jennifer Aniston) slept with his boss. I’m not sure if an apathetic person would be upset by news like that. Nonetheless, Office Space works as a workplace comedy, and I think it’s a good one to pick up if you want a good laugh. Instead of the visual humor that more recent comedies generally go for, Office Space just made very judicious use of clever dialogue.